The Africa Internet Summit (AIS) 2014 Second Edition, having for theme “Beyond Connectivity: Internetworking for African Development”, took place from 25 May to 6 June 2014 at the Kempinski Hotel in Djibouti, Republic of Djibouti. AIS 2014 included tutorials (25 May to 2 June) and conference (3 June to 6 June), where delegates shared knowledge on Internet policiesand technical issues. AIS 2014was hosted by the Djibouti Telecom under the high patronage of the Ministry of Communications in charge of Posts and Telecommunications. We counted among us as sponsors BringCom, Freenom , China Communication Services (Hong Kong) International Limited, Afilias, Ericsson, GSK, Wiocc, Djibouti Data Center, France IX, Google, Internet Corporation for Assigned Names and Numbers (ICANN), Internet Society, Organisation Internationale de la Francophonie (OIF), Telecom Italia Sparkle, NSRC, NetworkTheWorld.org, Seacom, First, Free BSD ,Jpcertcc, Inasp, O'reilly and Association of African Universities. More than 200 people attended the AIS trainings, which included AfNOG, ISOC, AfREN,AfricaCERT,and AFRINIC workshops and tutorials. The AIS 2014 Conference officially opened on 2 June. As guests of honour, we had HEM Abdul Kader Kamil Mohamed, Prime Minister of Djibouti, representing the President, and HEM Ali Hassan Bahdon, Minister of Communications in charge of Posts and Telecommunications. The Conference then continued with the AfNOG plenaryheld on 3 June and AFRINIC 20 heldfrom 4 to 6 June. 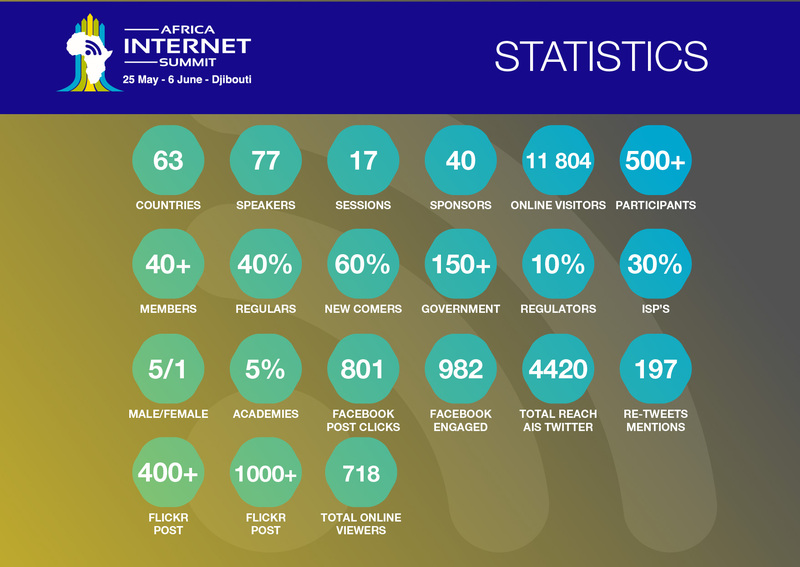 The AIS 2014, organised jointly by AfNOG and AFRINIC, in collaboration with Af* Organisations, was made of 17 plenary sessions with 77 speakers presenting and discussing Internet issues for the region and globally, with over 500 participants coming from 63 countries in attendance. This year’s summit highlights the importance of improving local infrastructure and increasing capacity building activities in order to support the development of local content, local traffic routing, e-commerce and ultimately economic progress and social development. Mr Mohamed Assoweh Bouh, Director General of Djibouti Telecom paid tribute to the relentless effort and sacrifice made by pioneers of the Internet in Africa. “ICT is an opportunity for bridging the knowledge gap in Africa” and also stated that Djibouti’s goal is to become a regional ICT hub for the East African and Arab regions. Adiel Akplogan, CEO of AFRINIC recognised the contribution and commitment of instructors who as volunteers make the transfer of knowledge possible. Dr. Nii Quaynor, AFNOG’s convener, spoke on developing technical know-how and exchange for the Internet in Africa for the community. Dr. Nii added that new issues are emerging and the openness of the Internet is what has helped the Internet grow in Africa. Badru Ntege, AFRINIC’s Chairman said AF* are here for the community and for the next billions that will make the future Internet. Mr Badru spoke about the spirit of unity which symbolizes the AISand the need to help each other get the knowledge needed to put Africa on the world Internet map. The Minister of Communications, HEM Ali Hassan Bahdon mentioned that Djibouti encourages the private sector to invest more in the Internet as too much control over the Internet isn’t beneficial. The Prime Minister of Djibouti HEM Abdul Kader Kamil Mohamed reiterated that the digital divide is also an economic divide and making the Internet work for the future of the continent. The Opening Ceremony took place in the Nakheel Conference Hall. Over 400 participants attended the Ceremony. Workshops sessionsat AIS 2014 were concluded on 2 Junewith several interesting topics. The ION Workshop had great discussions on IPv6, DNSSEC and the situation in Africa. For the Day other workshops were also on the agenda: the Content Management Training, Mobile Application Development, Google Apps, DNSSEC and AfREN, the African Research and Education Networking (AfREN). AfREN is a forum of the academic and research community set up to foster collaboration and discuss issues related to research and education networks and delivery of advanced service. Over 200 participants attended the workshops sessions at AIS14, which were held from 25 May to 2 June. The AFNOG plenary session took place on 3rd June. The session was highly interactive with discussions on current Internet technical and business issues, such as the importance of Mobile Application, Peering, Security, IPv6, Carrier GradeNAT,and Internet leadership. After the welcome and sponsor speeches, Douglas Onyango from Wipro Technologies gave a presentation on BestCurrentOperatingPractices. Mr Abas Ikbal from Red Comms Communication Services explained how bandwidth speed measurement tools can be useful and how it can be used to improve routing and traffic engineering optimizing new IT services likeVOD, cloud services,and voip. The presentation Next Generation IDC showed that with the Iaas platform Green, Cloud, and Intelligent technology will be in the new IDC making IDC energy saving,virtualized and smart. Mark Mc Fadden from Intercommunications talked on the delicate relation between CGN and extending the address space that is further divorcing Internet users from identifiable IP numbers. The Africa Internet Youth Leadership Project (Y-I-LEAD)was launched during the open discussion with the community at AIS 2014. It will help harness the great wealth of resource/energy of African youth towards ensuring their visibility in Internet entrepreneurship and leadership roles. Later in the afternoon, Frank Habitch spoke on behalf of Philip Smith. The presentation described the current state of the BGP table, and looked at the level ofde-aggregationtakingplace. Mrs Oubah Malow presented on an IXP project in Djibouti. The steps Djibouti Telecom will follow to establish anIXP and play an important role in the peering activities in the region by linking East African IXPs to major European and Middle EasternIXPs. MrAberto Mercateli took the floorforthe final session and proposed several tips to help selecting a potential peering partner or upstream provider using free tools availableontheweb. The FIRE Programme came to an end on 3 June. During AIS 2014, FIRE organised two workshops: Project Monitoring and Evaluation, and Grant Proposal Development. The selected participants were introduced to M & E processes in a project management cycle and were trained in the principles of M&E for better result measurements. Balancing the competing constraints. The trainer concluded his course by encouraging participants to always have SMART indicators for their activities, outcomes, and impact of their projects. This workshop was set to build the capacity of potential grant applicants in order to improve the quality of their proposals. Once developed, these proposals will be presented to the FIRE Programme and to other potential donors, sponsors, or investors. Chehem Ibrahim Mohamed (Djibouti Telecoms) made a presentation on EHealth: the key concepts, objectives and spheres of e-Health, as well as its application and usage in Djibouti. Implementation of e-health platforms such as telemedicine and remote medical consultations platforms, and the NationalSanitary Information System project in Djibouti were highlighted. Nikunj Gupta of Ericsson introduced the benefits of using the Ericsson wallet platform, a mobile money transfer application. The wide array of mobile services washighlighted as well, andthe advantages of mobile moneytransfer apps and its functionalities were also demonstrated. The panel was composed of Adiel Akplogan (AFRINIC), Nii Quaynor (AFNOG), Theresa Swinehart (Verizon) remotely, Moez Chakchouk (ATI- Agence Tunisienne d’Internet), and Towela Nyirenda-Jere (NEPAD). Anne-Rachel Inne (AFRINIC) moderated this panel. The session spoke of the Resiliency and stability of IANA functions, debating on which accountability mechanisms to put in place. Debate outcomes call for a working group that will steer discussions in the African region and help all communities be part of the discussions. Community members present reiterated that the process should not affect the openness of the Internet or disenfranchise the African Community. AFRINIC has put together a page on its mailing list () to receive comments. Backbone provider: Andrew Alston, of Liquid networks, gave an overview on the challenges faced as a backbone for deploying IPv6. However they have successfully managed to deploy IPv6 as a single topology network, all across the East African coast, with plans to have all metro-edges on IPv6 by the end of 2015. Content Delivery Network: Martin Levy, of cloudflare, explained the role of intermediaries in deploying IPv6, and showed the amount of IPv6 content available through the Alexa statistics. Helpdesk: Jan Zorz, of deploy 360, shared a community-driven document that covers different issues and the proper response guidelines for help desk operators to apply when they receive IPv6 related tickets. An ongoing debate about IPv6 deployment or extension of the existence of IPv4 through relying on NAT technologies was sparked and addressed during Q&A. The community displayed great support for deploying IPv6, and a number of ISPs that have deployed IPv6 shared their experience. Jeremie Godrech from Freenom focused his presentation on Building a local domain name industry, a crucial role for any Top Level Domain Registry and how it directly affects the success of their extension in their market. Making domain names more easily accessible and widely distributed, the Registry is able to increase the demand for domains, thus can positively influence its community. The presentation looked at how to develop this strategic sector on a national scale. Maria Farrell, from Interconnect Communications: Cybersecurity for ccTLDs: Metrics and Best Practices. The presentation discussed the initial findings and draft ccTLD Cyber Security Best Practices and Metrics, from Oxford’s GlobalCyber Security Capacity Centre. The session also included DNS security andnational sovereignty, data privacy and law enforcement access, intellectual property rights protection, malicious activities andattacks and ways to address them. Following the signature of the Registry Agreement with ICANN in March 2014, the ZA Central Registry is in the process of taking the final steps towards the launch of the dotAfrica TLD. Fabrice Djossou’s presentation highlighted the Right Protection Mechanism in place, such as the Mark Validation System and the Reserve Name List Policy, for an efficient launch as well asan overview of all processes that must be completed before the delegation of the dotAfrica. The next presentation was made by Zong Zhong from China CCSI. The topic ‘’The future of the Internet’’ consisted of three parts. It started with the development of the future Internet, described the research status of the future Internet and ended with the key technology of Internet. The second presentation discussedNetwork Platforms making ISPs smarter. This presentation introduced the DPI platform providing the characteristics of the DPI platform and ending with the network management system. Mr Guan Hongcho (China CCSI) gave this presentation. Yaovi Atohun (ICANN) presented on WHOIS andRDS while Bob Ochleng (ICANN) discussed current status of ICANN new GTLD programme. The Newcomers session introduced the audience to the AIS concept and how AFRINIC relates to the Internet Ecosystem. AFRINIC’s mission, structure, activities, and Policy Development processes were explained: community-ruled, open and bottom-up policies adopted by AFRINIC. A list of AFRINIC’s current policies was presented to the AIS audience. Badru Ntege(AFRINIC)gave an introduction on AFRINIC,policies,AGMM and members. Towela Nyirenda-Jere concluded the session with a presentation onNEPAD/AUC African ICT strategy. The AFRALO session was carried out in the Ile Syan Room. The title for this session was: ICANN new season: A home for everyone. The panelists:Emmanuel Adjovi from Organisation Internationale de la Francophonie giving the government’s perspective on ICANN’s new season. Pierre Dandjinou from ICANN spoke about the ICANN African Strategy. Barrack Otieno had his presentation on ccTLDs’ perspective on ICANN’s new season. Janvier Ngnoulaye from the University of Yaoundé provided the Internet endusers’ perspective, while Towela Jere from NEPAD gave the regional organization perspective. The debate was animated and passionate and showed that all participants were very optimistic regarding the future of the Internet and its governance. The panel found that thenext few years will be of most importance, and expressed their hope that the transition from the US government stewardship to a community one will be achieved smoothly and swiftly. An evening cocktail concluded the Day at the Grand Barra Room at Kempinski, giving the AIS organising committee the opportunity to acknowledge this year’s sponsors, who supported the organization of the Summit through Financial or InKind Sponsorship. We took this opportunity to thank them again for all their support. The Day started with the AFRINIC Global updates. This session offered an update from institutions managing Internet number resources globally. Regional Internet registries, namely APNIC, for the Asia-Pacificregion, ARIN for the North American region, LACNIC, for the South American region, and RIPE NCC for the European region as well as the NRO, ASO and IANA, reported on their activities and shared their experiences with delegates. The session was chaired by Anne-Rachel Inne from AFRINIC. The policy sessions followed at 11:00 am. It started with a brief introduction of the policy development process by Seun Ojedeji (PDWG Co- Chair). Ernest Byaruhanga (AFRINIC) then gave updates on recent mailing list and policies discussion in the other regions. After Lunch, the community discussed two policy proposals: The Academic IPv4 Allocation Proposal (AFPUB-2013-GEN-001-DRAFT-03) by Andrew Alston and Sunday Folayan and the AFRINIC Whois Database Update Process (AFPUB- 2014-GEN-001-DRAFT-01) by Jean Robert Hountomey. The two policies did not reach consensus at the Meeting and therefore these will be sent to the RPD mailing list for further discussion. We also had updates on the Resource Policy Manual Status Report in addition to the Policy Implementation Report by Ernest Byaruhanga and Madhvi Gokool, respectively from AFRINIC. There were discussions on the proposed modifications and enhancements to the Policy Development Process (PDP). The election for the PDWG co-chair was then conducted which saw Adam Nelson from Kenya elected. In addition to the policies discussion there were two afternoon sessions ICT in Djibouti where ICT professionals from Djibouti talked on the development of this sector at the local level and the second panel discussed ICT in Higher Education. This panel addressed the important and contemporary issues and challenges that Higher Education is facing. Boubakar Barry has won the 2014 Network Information & Infrastructure (NII) Service Award. Originally from Senegal, Mr. Barry won the award for his commitment to capacity building and Internet development in Africa. He has been involved in capacity building through the Research and Education Networking Unit of the Association of African Universities for many years and has been a key player in the African Internet community. As a convener of the Africa Research and Education Network (AfREN) and CEO of the West and Central African Research and Education Network (WACREN), Boubakar becomes the sixth winner of the NI&I Award. The award was presented to Mr Barry by Mr Alan Barrett at the Kempinski Djibouti Hotel during a gala dinner. AIS 2014 delegates had an opportunity to enjoy Djiboutian cuisine and entertainment by local artists. The NII Young Professional Award went to Abibu Ntahigiye. Mr Ntahigiye of the Tanzania Network Information Centre (tzNIC) has been involved in facilitating the establishment of ISOC-TZ chapter and capacity building initiatives by localising the AfNOG in Tanzania. The session on 6 June started with the AFRINIC Services updates. AFRINIC staff provided updates on key AFRINIC operational areas. The NoC report by Daniel Shaw followed. Duksh from AFRINIC then shared the outcome of his Online Localised Content Management Training, which took place from 31 May to 2 June. The Africa Internet Summit came to a close with words of thanks from the CEO of Djibouti Telecom, Mr. Assoweh Bouh, and CEO of AFRINIC, Mr. Adiel Akplogan. The Secretary General of Djibouti Telecom also thanked all the partners, the Af* organisations, and praised the success of the Summit. Gifts were then extended to Dr. Nii Quaynor, Badru Ntege, Adiel Akplogan, and Anne-Rachel Inne on behalf of the Ministry of Communication, represented by Ms. Fatouma Abdi. The AFRINIC Annual General Meeting took place from 14:00. The session held corporate updates from Operations, HR, Finance, IT and Engineering and Legal Departments. The AGMM held elections for three new seats, two of them on a regional and one on a non-regional basis. Members voted on site while remote participation was also possible through online voting. Kris Seeburn (Mauritius), Christian Bope (RD Congo) and Andrew Alston (South Africa) have been elected to represent the Indian Ocean, Central and NonRegional seat on AFRINIC Board.